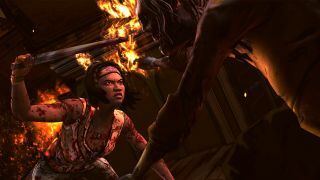 What We Deserve, the third and final part of Telltale's The Walking Dead: Michonne, will be out on April 26. Ahead of that, Telltale has put up another “Your Choices” video that reveals some of the decisions players made as they worked their way through the previous episode. It's about as pleasant as you'd expect, and be warned: There are many spoilers. As it turns out, Michonne—which is to say, you, you blood-soaked monsters—has both a talent and a taste for the ugly business of killing. Which isn't really all that surprising, I suppose, given that The Walking Dead as a whole isn't exactly known as the sort of fictional world in which people like to sit down and talk things out. Still, you try to do what's right... Right? My prediction: Nobody lives, everybody dies, and redemption is a cold, dreamless void spat from the barrel of a gun. Find out more at Telltalegames.com.